John Higgins made the eighth 147 of his career at the Coral Northern Ireland Open in Belfast today. 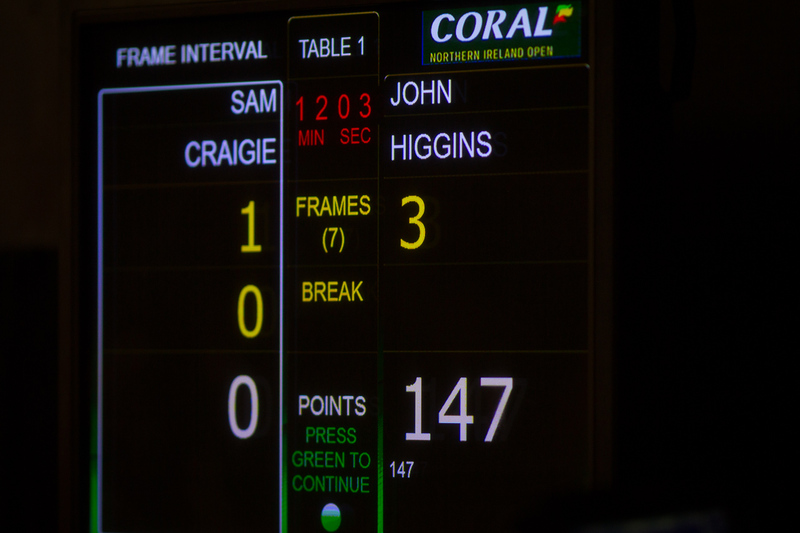 His perfect break came in the last frame of a 4-1 defeat of Sam Craigie in the second round of the world ranking event. The key shot was a brilliant cross-double on the final red which dropped into a centre pocket, allowing the Scot to pot the 15th black and clear the colours. It’s worth £10,000 from the rolling prize pot for 147s – plus the £2,000 tournament high break prize, as long as it’s not equalled this week. Higgins said: “I’m buzzing just now. After the last two weeks I’ve had and finishing off a good quality match like that is an unbelievable feeling. Higgins stands behind only Ronnie O’Sullivan (13) and Stephen Hendry (11) on the list of players with most official 147s. The 41-year-old is showing his best form in years having won the recent China Championship and Champion of Champions and he’s aiming for three titles in a row this week. It’s the fifth 147 of the season after those from Thepchaiya Un-Nooh, Stephen Maguire, Shaun Murphy and Alfie Burden, and 123rd in snooker history.